Activist for Elor Azariya calls on parents to send pictures of their children dressed as Azariya on Purim in order to participate in raffle. Ron Karmi Buzaglu, among the more conspicuous activists for the cause of soldier Elor Azariya, announced on Friday an interesting “costume competition” in light of the recent sentencing of Azariya to 18 months in prison for shooting a wounded terrorist in Hevron last year. In a post titled “The child of all of us!! !” Karmi Buzaglu called on parents to send him pictures of their children dressed in costume - as a soldier convicted for shooting a terrorist. “Send a picture of your children dressed as Elor Azariya and participate in the big raffle. The picture that receives the greatest number of ‘likes’ will win its owner a classical guitar and a family vacation (to the winner and his parents), courtesy of Tzahi Eliyahu of Legenda Suites,” he wrote. 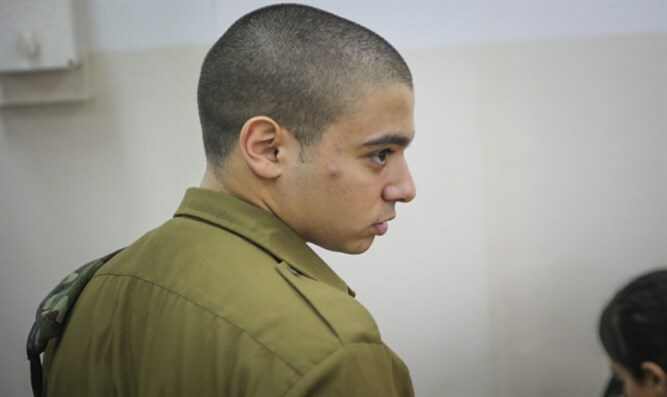 On Thursday, PM Netanyahu addressed the sentence, saying that he supported a pardon for Azariya. “Soldiers in dangerous situations are likely to be deterred and, therefore, we need to show understanding and grant a pardon,” the PM said regarding his view. He thus joined the list of voices, including those of Education Minister Bennett and Culture Minister Regev, calling for Azariya to be pardoned.